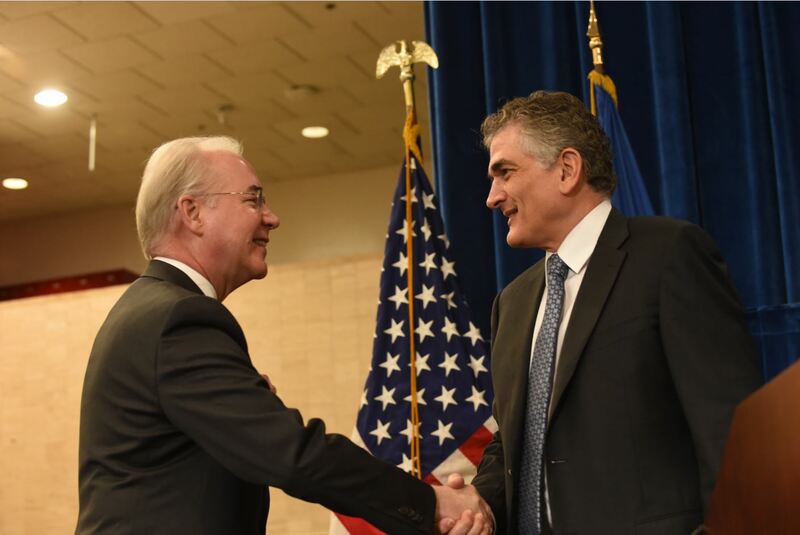 Jeff Bailet (right) M.D., Blue Shield of California’s executive vice president of Health Care Quality & Affordability, welcomes Health and Human Services Sec. Tom Price to the Physician-Focused Payment Model Technical Advisory Committee’s (PTAC) meeting in Washington D.C. where the committee considered innovative payment model submissions from around the United States. Last month, Health and Human Services Secretary Tom Price made an important announcement, encouraging physicians with innovative ideas on payment models that deliver quality care while controlling costs to share them with the rest of the nation. The call to action was made during a meeting with the Physician-Focused Payment Model Technical Advisory Committee, also known as PTAC, which was created to consider such proposals and make recommendations to the HHS Secretary. Jeff Bailet M.D., Blue Shield of California’s executive vice president of Health Care Quality and Affordability (HCQA), is the chairperson of PTAC and we’ve asked him what PTAC is and the significance of its work. What is the Physician-Focused Payment Model Technical Advisory Committee (PTAC) and what is the group’s purpose? PTAC was created by the Medicare Access and CHIP Reauthorization Act of 2015, also known as MACRA, which calls on the Centers for Medicare & Medicaid Services (CMS) to find innovative ways to pay physicians for the care they provide to Medicare beneficiaries. MACRA also creates financial incentives to encourage physicians to participate in what we call Alternative Payment Models as well as development of physician-focused payment models. PTAC’s purpose is to gather proposals for new payment models from around the nation and make recommendations to the Secretary of the Department of Health and Human Services to deploy some of these ideas across the nation. There are some extremely smart and talented people on PTAC with impressive experience in health care delivery, alternative care model development and implementation, and health care policy and economics. I’m honored to be serving on this committee with them. Why is this work so important? Why is value-based payment so important in health care? It’s no secret that our health care system is challenged and the cost of care is rising at unsustainable rates. The latest CMS data says the U.S. health care spend grew to $3.2 trillion in 2015 – that’s nearly $10,000 per person – and now represents about 18 percent of our nation’s GDP (gross domestic product). Current projections forecast total healthcare spending to reach $4.4 trillion by 2018. So, the question is how do we ensure people have access to high quality care that’s also affordable? The traditional fee-for-service system, where physicians, hospitals and other care providers receive payment based on the quantity of care is unsustainable. So, PTAC’s work is part of a nationwide effort to discover value-based models that provide financial incentives to providers based on the quality of care provided rather than the volume of care delivered. How many proposals has PTAC received? Any from California? So far we’ve received nine proposals as well as an additional 17 letters of intent from providers around the country including two from California. There are very clear guidelines established by the secretary on what criteria the submissions will be measured against. Last month, PTAC met to consider three of the nine proposals, and the committee decided to recommend two of them for consideration by Secretary Price. Again, we know there are some very unique and potentially ground-breaking alternative payment models out there that could have an important, positive impact in our health care delivery system by improving quality and lowering costs and I hope those ideas continue to be submitted for evaluation. How can health plans participate in this effort? Is Blue Shield doing anything in this area? Broadly speaking, I believe health plans have a very important role in supporting the development, adoption and implementation of new value-based payment models that deliver high quality care to people while making the cost of that care sustainably affordable. Here at Blue Shield, we’ve already been on this path for some time. Our Accountable Care Organization (ACO) program is now in its seventh year and the goal of our ACOs is essentially similar to what PTAC is trying to accomplish. For us, what began as a single collaborative effort with Hill Physicians and Dignity Health in Sacramento now has grown into 42 ACO collaborations across California. Since we embarked on this journey, we estimate that the work with our ACO providers has improved clinical quality and saved about $440 million. Still, our work is far from over and the requirements of the HHS secretary’s alternative payment model criteria is pushing us to be even more innovative on how we deliver truly value-based care. Blue Shield is applying to participate in Medicare’s Comprehensive Primary Care Plus (CPC+) Advanced Alternative Payment Model for January 1, 2019. Also, beginning in 2019, commercial plans will be able to participate with provider partners in other new alternative payment models. We need to ensure our systems and processes are capable of supporting providers with timely, accurate performance data as they participate in these new innovative models. It’s a daunting challenge, but I’m confident that together, our healthcare industry – physicians, hospitals, health plans and other clinical providers – can make these much-needed improvements in our health care system.